We know stone . . .
At Granite Countertops by Bell, we specialize in the creation and installation of solid stone counters that will bring instant beauty and utility to your kitchen, baths, fireplace, desktop, offices, and floors. 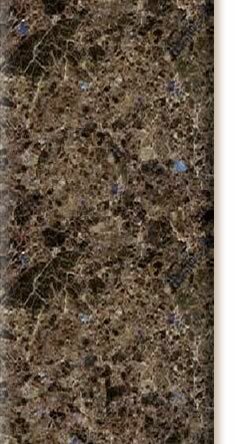 We use only the finest granite, marble, and other materials matched with the latest technology to produce a countertop recognized now and in the future as "the best." Bell Memorials has served Kansas since 1889. The location in Beloit has been in operation since 1946. Jim and Ruth Bell are carrying on a tradition of providing quality products using the latest technologies combined with a genuine respect for the art and craftsmanship of stone masonry. 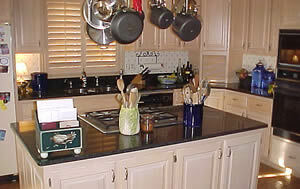 While have in the past created countertops from marble and other stone, we have found that nothing compares to the flexibility and performance of granite. Choose from among more than a dozen colors. Make sure your new stone countertop measures up by selecting Granite Countertops by Bell for your stone! See our "no scratch" video!